Qualtrics <https://www.qualtrics.com/about/> allows users to collect online data through surveys. This package contains convenience functions to pull survey results straight into R using the Qualtrics API. See <https://api.qualtrics.com/> for more information about the Qualtrics API. This package is community-maintained and is not officially supported by Qualtrics. This project contains an R package to download survey responses from Qualtrics using the API. Note that your institution must support API access and that it must be enabled for your account. Whoever manages your Qualtrics account can help you with this. Please refer to the Qualtrics documentation to find your API token. I am not affiliated with Qualtrics and they do not offer support for this package. All dependencies will be installed when you install qualtRics. Periodically check this repository for updates and execute devtools::install_github("JasperHG90/qualtRics") to update. getSurveys() fetches a list of all surveys that you own or have access to from Qualtrics. getSurvey() downloads a survey from Qualtrics and loads it into R.
readSurvey() allows you to read CSV files you download manually from Qualtrics. registerOptions() stores your API key and root url in environment variables. getSurveyQuestions() retrieves a data frame containing questions and question IDs for a survey. qualtRicsConfigFile() prints information on how to make a .qualtRics.yml configuration file that stores your qualtRics API key, root url and other options in your working directory. metadata() retrieves metadata about your survey, such as questions, survey flow, number of responses etc. Note that you can only export surveys that you own, or to which you have been given administration rights. verbose: Logical. If TRUE, verbose messages will be printed to the R console. Defaults to TRUE. useLabels: Logical. TRUE to export survey responses as Choice Text or FALSE to export survey responses as values. useLocalTime: Logical. Use local timezone to determine response date values? Defaults to FALSE. dateWarning: Logical. Once per session, qualtRics will emit a warning about date conversion for surveys. You can turn this warning off by changing the flag to FALSE. Defaults to TRUE. The second method involves placing a configuration file called .qualtRics.yml in your working directory. You can also call this function while passing api_token and root_url values to the function, in which case <YOUR-API-TOKEN-HERE> and <YOUR-ROOT-URL-HERE> will be replaced by your credentials. After saving the file, you can register your credentials by calling registerOptions() without passing any parameters. When you load the qualtRics package, it will automatically look for a .qualtRics.yml file in the working directory, in which case you don&apos;t need to call the registerOptions() function to register your qualtRics credentials at the beginning of your session. Save the file as .qualtRics.yml and execute registerOptions() or restart your R session and execute library(qualtRics) to load the configuration file. 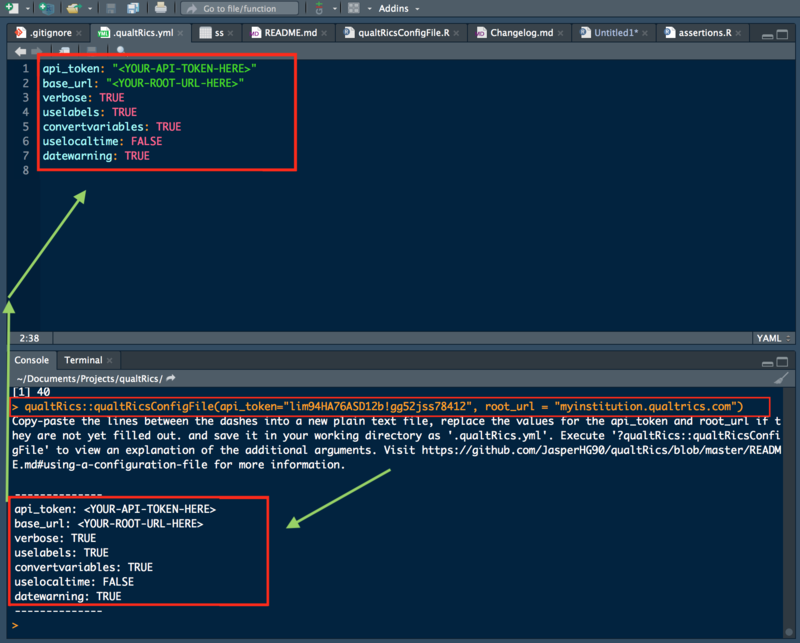 You can edit your configuration file by executing file.edit(".qualtRics.yml") in the R console. From version 2.5, qualtRics supports the automatic conversion of specific variable types (see table below) since users already specify most information needed for such a conversion when they design their survey. This data can be used to turn the variable into a factor automatically. # or pass it to the function. Note that your date and time settings may not correspond to your own timezone. You can find out how to do this here. See this page for more information about how Qualtrics handles dates and times. Keep in mind that this is important if you plan on using times / dates as cut-off points to filter data. # Retrieve a single survey, filtering for questions I want. Note that dates are converted without a specific timezone in mind. You can specify your own timezone using these instructions. 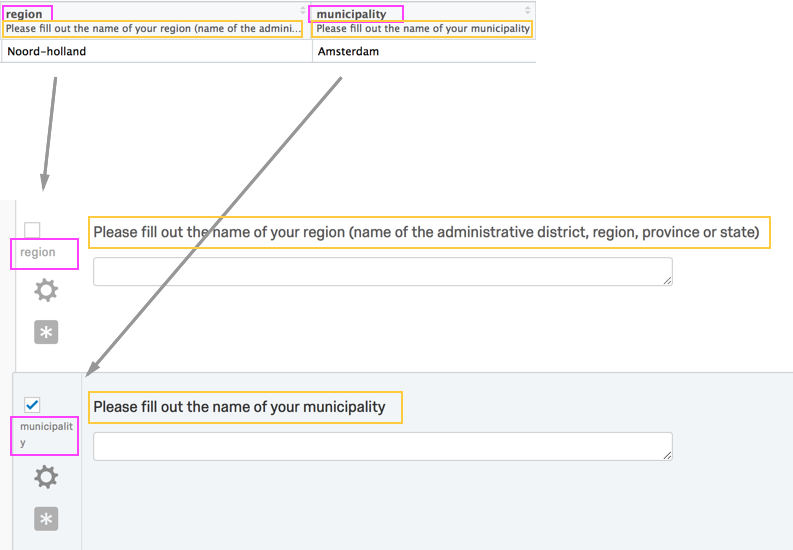 To avoid special characters (mainly periods) in header names, readSurvey uses question labels as the header names. The question belonging to that label is then added using the sjlabelled package. Qualtrics gives names to these labels automatically, but you can easily change them. For specific information about the Qualtrics API, you can refer to the official documentation. If you make big changes, add your name to the &apos;Author&apos; field. QualtricsTools creates automatic reports in shiny. qsurvey by James Dunham focuses on testing and review of surveys before fielding, and analysis of responses afterward. Thanks to everyone who lets me know about issues, bugs etc. I appreciate your help a lot. Special thanks to those who add code! h/t @phoebewong, @samuelkaminsky, @eknud, @strengejacke, Adrian Brugger and Stefan Borer. readSurvey Read comma separated csv file from Qualtrics. 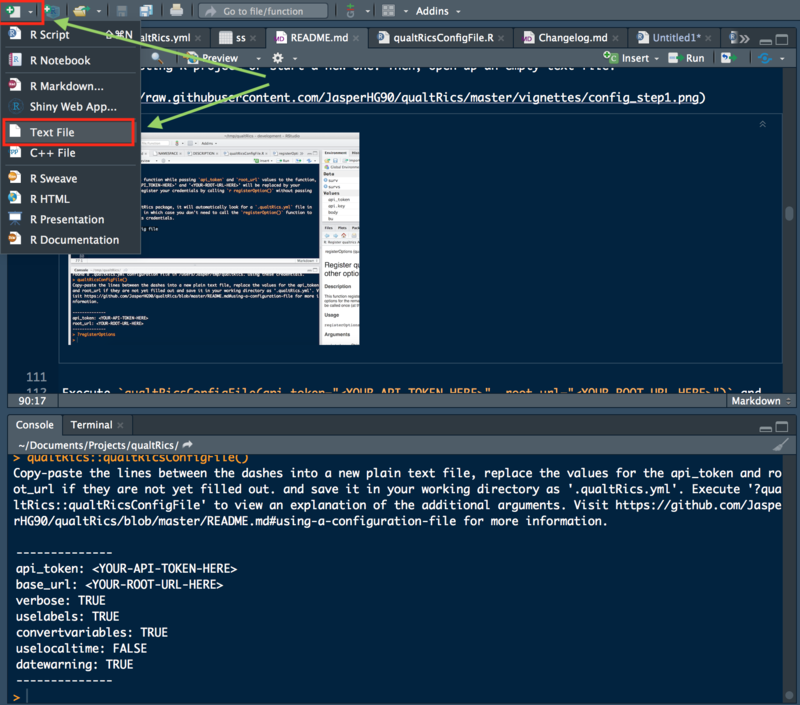 qualtRicsConfigFile Prints an example of a qualtRics configuration file to the console.